The territory of our comfort—how would you describe yours? 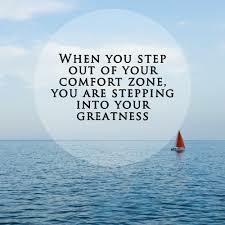 Our comfort zone is one of the hardest places to drag ourselves away from. Life is meant to be a magnitude of opportunity, and when the Universe recognizes you are ready to grow, it also knows the time has come for you to begin to move away from your comfort zone. The possibilities that will come your way to help you with that process when you are ready will be incredible. These openings, the ones that our Soul receives when we are in a period of expansion, always appear as synchronicities. Synchronicity shows up to bring awareness to what we have paid little or no attention to in the past. Some of those synchronistic events will be situations to test you as well, and they might make you feel really uncomfortable. When this happens you might find yourself asking why. Why would the Universe be so heartless and unsympathetic at times when we are already so vulnerable? When this kind of synchronicity shows up for us to ponder, it is simply because the Universe wants us to examine how rooted we are in what we have already become aware of. These tests are an opportunity to help you along your spiritual path and to help you become more spiritually grounded. They will certainly test the limits of your comfort zone as well. The outcome and result of these examinations solely depends on the decisions that you decide to make. When these events show up, be very careful of how you interpret them. When you are faced with something that might seem spectacular, but also on the other hand weird, be cautious but also leave the window of curiosity open as well. It is at times like this that you really, really have to tune in and connect to your intuitive nature. This, after all, is the gift that the synchronicity is offering you, a chance to strengthen your intuition, your Soul’s voice. Those butterfly feelings you get inside are known as your gut feelings, and this is the place where your Soul lives and how it connects to you. This is the place you must home in on when you are faced with a life-changing decision of some sort. If the feeling you get is nasty, then you can trust that it is a test, and you should probably run for the hills. If the feeling you get is a good one, then no doubt this will be your answer and one you can trust. If the feeling you get is undecided, what do you do, what does that mean? It might signal that you are not yet fully trusting of your intuition and you have more inner work yet to do. In a case like this, if you are able to walk away from the situation at hand, that might be your best option at the present time. When you are ready the opportunity will show itself again, perhaps not in the same way, but it will come around another time, as we are always given a second chance to visit what the Universe is trying to offer us. One of the most incredible feelings in the world happens when your Soul puts you through a growth test, you see the synchronicity in it, and you pass the test. When you are able to clearly see the message from the Universe and you act accordingly, what you will feel is indescribable. When you were a kid and your parents took you to see a fireworks display, do you remember the awe that you felt inside as you looked up to see the array of colours in the darkened sky? The loud crackling as the jets of lights shot into the black of night? When you were little, this kind of experience was magical and extraordinary, and as a child you stood in the magic and nothing else existed. When you become more conscious and aware of what you hadn’t noticed before in your life, you might experience the same feeling you had when you were a small child gazing up at those spectacular explosions in the night sky. This can be related to how you will feel when you move out of your own comfort zone and begin to explore the growth of your Soul, something that can be euphoric. When you are able to see for yourself how far you have come on your Soul’s journey, it truly gives you something to celebrate.